Dr. Asif Ilyas, a hand and wrist surgeon, was about to close his patient’s wound. But first he offered her the opportunity to behold the source of her radiating pain: a band of tendons that looked like pale pink ribbon candy. With a slender surgical instrument, he pushed outward to demonstrate their newly liberated flexibility. “That’s pretty neat,” the patient, Esther Voynow, managed to gasp. The operation Dr. Ilyas performed, called a De Quervain’s release, is usually done with the patient under anesthesia. But Ms. Voynow, her medical inquisitiveness piqued and her distaste for anesthesia pronounced, had chosen to remain awake throughout, her forearm rendered numb with only an injection of a local anesthetic. So she had been able to watch as Dr. Ilyas first sliced into her swollen right wrist, tugged gently at skin flaps, and then opened a small bloody crater, exposing the inflamed sheath that had trapped her tendons. Now she could see why her thumb and wrist had been relentlessly throbbing. I was awake during a colonoscopy. As soon as the procedure was over I put my pants on and drove home. As a heads-up to staff members, some hospitals now post warning signs on the O.R. door: PATIENT AWAKE. Choosing to watch your own surgery is one more manifestation of the patient autonomy movement, in which patients, pushing back against physician paternalism, are eager to involve themselves more deeply in their own medical treatment. 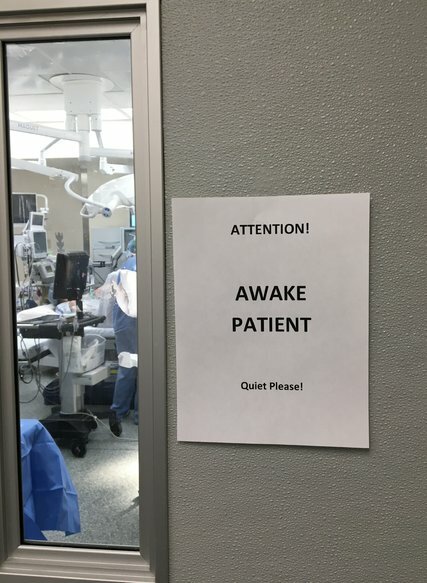 Indeed, a few studies suggest that some patients feel less anxious about staying awake during surgery, despite possible gruesome sights, than they do about being sedated. Other patients, studies show, are very anxious about general anesthesia, particularly right before an operation, afraid they will not be able to wake up afterward. Some operations, including deep brain stimulations, require the patient to be awake for critical communication. But as anesthesia alternatives like regional nerve blocks and site injections become increasingly sophisticated, many more procedures are possible with the patient fully alert or moderately sedated. Orthopedics is the chief specialty for such procedures, but surgery in breast, colorectal, thoracic, vascular, otolaryngological, urological, ophthalmological and cosmetic specialties is also moving in this direction. Studies show that regional anesthesia has fewer complications than general anesthesia and is less expensive. Recovery time is swifter and side effects are fewer, which can reduce the need for postoperative opioids. But many doctors view awake surgery with apprehension. What happens if the patient becomes too anxious? Distracts the surgeon with too many questions? Or objects vigorously when a trainee scrubs in — a mainstay of surgical education? Patient satisfaction, however, tends to be high. Ms. Voynow did not need a preoperative physical exam, blood work, an I.V. drip or even an attending anesthesiologist. As nurses wheeled her on a gurney out of the O.R., she looked pleasantly surprised. “I’ve had root canals that were worse,” she said. Scarcely a half-hour after the surgery, she drove herself home, using her right hand, which had just been operated on. By contrast, if she had been given general anesthesia, she would most likely have needed several hours to recover, possibly had side effects like dizziness and nausea, and required someone to drive her. An anesthesiologist would have been necessary throughout the operation. And billed accordingly. “If I want sedation, I’ll have a beer,” said David S. Howes, who has had several awake procedures (and who is himself a doctor, an emergency physician in Chicago). During his awake colonoscopy, he discussed fly-fishing with the gastroenterologist. He had two total knee replacements with only regional nerve blocks. Knowing that the knee replacement would take several hours, Dr. Howes came prepared. While surgeons put in the new joint, he read The Economist. Whether the patient is offered the option of staying awake depends on many factors: the amenability of the surgery, the willingness of the surgeon, the flexibility of the anesthesiologist and the ability of a busy hospital to customize procedures. Although typically patients meet and make decisions with an anesthesiologist moments before an operation, Dr. David M. Dickerson, an assistant professor of anesthesia at the University of Chicago, confers with patients earlier, at a surgical clinic intended to coordinate and personalize medical care. Patients sometimes overestimate their ability to handle the unfamiliar stimuli of the operating room, said Dr. Stavros G. Memtsoudis, a researcher and professor of anesthesiology at Weill Cornell Medical College. “The patient will keep asking, ‘What is my heart doing? Is that beep normal? Is this normal?’ I might say, ‘If you’d rather go to sleep you can, because I can see your blood pressure is going up because you’re so stressed and you’ll bleed more,’” said Dr. Memtsoudis, who is also an anesthesiologist at Hospital for Special Surgery, an orthopedic center in New York where regional anesthesia is common. He also keeps on hand headphones, music selections and video glasses to soothe anxious awake patients. Dr. Ilyas, the hand surgeon, who is also an associate professor of orthopedic surgery at Thomas Jefferson University in Philadelphia, began routinely offering awake options to patients about four years ago. Among other advantages, he said, patients enjoy having a better understanding of their medical problem. And because they are awake and can follow direction, Dr. Ilyas can test their mobility right away to learn whether he needs to do further repair. “You get more ownership and appreciation of the treatment from patients,” he said. Now when he gives patients the choice to be awake or asleep, Dr. Ilyas said, about 80 percent are opting to be awake. But when Dr. Ilyas himself needs surgery, he is still rather old-fashioned.